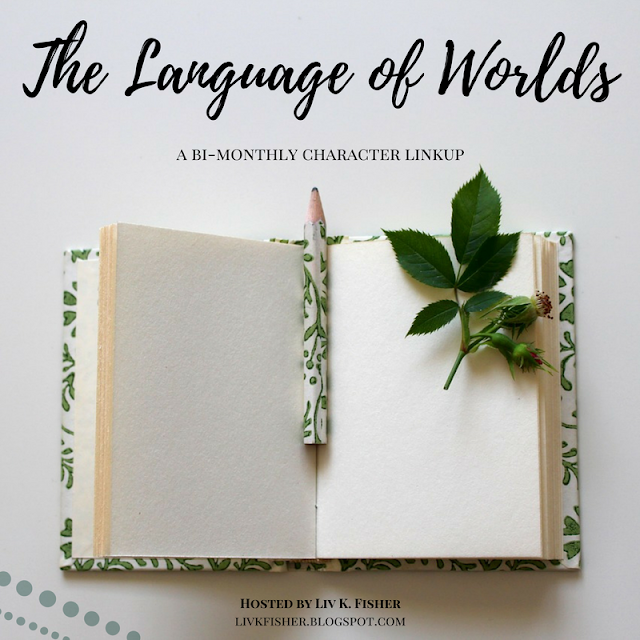 Friend and fellow author Liv K Fisher has started a new link-up about characters! Which is awesome, because I love talking about my characters! The link-up is specifically tailored for works of Christian Speculative Fiction (which is cool, because a lot of times these types of link-ups are more geared toward contemporary characters, and there are questions like: “What is in your character’s fridge?” and my characters are all like, “What’s a fridge?” and then I have to explain it and they think it’s magic, and we go quickly off on random tangents). Anyway, here goes! Today, we’re going to talk to about Wynn. Wynn is one of those characters who has kind of given me a lot of trouble as I’ve been writing the Turrim Archive. He has very definite opinions on who he is, but he’s been a bit reluctant to share them with me until it matters for the story. For example, I thought he was going to be a kind of extraverted, rambunctious trickster who is just smart enough to get into the Academy with his more serious, hard-working friend, Grayden. However, over the course of books 2 and 3, Wynn revealed that I had him all mixed up and backwards. He is scary smart, super introverted, and extremely focused. Where does your character live, and how does that impact them? Wynn lives in the country of Dalma, in a small village called Dalsea on the northern side of a small mountain range that separates Dalma from Ondoura. This quiet village life is something he has always enjoyed, but he dreams of exploring more of the world and seeing the sights and wonders it has to offer. If they could book a vacation to anywhere in the/their world, where would they go and why? Literally anywhere. He would love to see the Crystal Domes of Adamal in Vallei most of all, I mean, that’s pretty much the destination most people dream of seeing. But after that, he’d love to go to the shipyards of Malei. He’d love to see the inner workings of the train-stations, even though they are no longer functional. Wynn has always loved the trains (mostly because his father tells stories about when he used to travel and ride them), and his greatest regret is that he was born too late to ever get to ride in one. On a scale from 1 (low) to 10 (high), how ambitious are they? It depends a lot on what you’re talking about. Wynn’s ambitions are very tailored to his own interests. When it comes to a project, he’s off the charts about seeing it through to the end. He is hyper-focused and often forgets to eat or sleep when he is working on a project. If he gets an idea in his head that he wants, he will do anything it takes to get it (like going to the Academy), but his ambitions are his own and he has his own reasons. Fame, power, glory, money… these are not the things that motivate him. What do they want to achieve long-term? Long-term, Wynn wants to have adventures like his father did. He wants to build things that are useful. But deep down, I think Wynn really wants nothing more than to make his parents proud of him. He feels that he has been a sort of burden to them, and he does not want to cause them grief or worry. Grayden inspires Wynn. Grayden is outgoing and good with people. He’s smart, but not to the point where it gets in the way of being able to interact well with people. He’s fun, but also dedicated. If there’s one person in the world Wynn would rather be than himself, it would be Grayden. The great architects and builders of old also inspire him, and they motivate him to try crazy ideas and think outside the box when he is working on his own theories and projects. How would they handle seclusion? Not well. Though he doesn’t mind seclusion at all, it also scares him. Wynn knows that without people around, he might get so involved in a project that it can become a race to see whether he finishes the project before forgetting to eat puts him in danger of starving to death. Are they a cat person, or a dog person? Wynn is not really an animal person at all. If he had to choose, he’d probably pick something more self-sufficient, like a cat, but only because then he wouldn’t have to worry about forgetting to feed it. Wynn likes warm weather. Warm weather is better for building things… when it’s warm out, he doesn’t have to worry about gears sticking or paint not drying properly on his models. He also has some issues with texture and clothes, and when it’s warm out he doesn’t have to bundle up as much, and he prefers that. When they’re hungry, does it show? How? Wynn spends a lot of his time hungry, simply because again, he gets so engrossed in his projects that he often forgets to eat. As such, he’s kind of adapted to it and it doesn’t bother him. However, if he goes too long without food, you can tell because he gets very pale and a little shaky. What’s one Bible verse your character would identify with? He knows he is different from most people, that he processes things differently, that he is smarter than they are, that he doesn’t always feel comfortable interacting with people because he never knows what to say or how to behave, and that he has obsessive tendencies that make people uncomfortable around him or worried for him… I think it would encourage him to know that he was created by a designer every bit as obsessive about details as he is, and that he was made that way for a purpose, and not by mistake. I hope you enjoyed this insight into one of my Turrim Archive characters. What do you think? Does Wynn sound interesting? He’s been giving me fits, actually… constantly springing surprises on me. He is by far the most difficult character I’ve ever written… but the more I get to know him, the more I like him! Do your characters ever surprise you in the middle of a series? I’m glad I’m writing all the books before publishing, because Wynn is definitely going to need some tweaking in book 1 to make him more consistent with what I know about him now! I think he sounds pretty awesome. Wynn sounds like a great character! I find scary-smart characters fun. His word sounds fascinating, also. I love Wynn. He gives me fits, but I love him. The world is pretty cool… very gaslamp fantasy… which is different and requiring boatloads of research! Wynn sounds like an interesting character! I can’t wait to read his story! Also, I love the idea of this linkup; I think I’ll have to join next month!